Beautifully engraved certificate from the National Fuel Gas Company issued in 1974-1975. 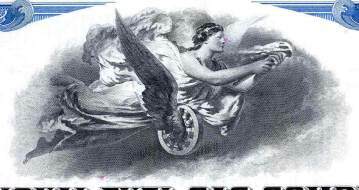 This historic document was printed by the American Banknote Company and has an ornate border around it with a vignette of a flying allegorical woman. This item has the printed signatures of the Company’s President and Secretary and is over 26 years old. 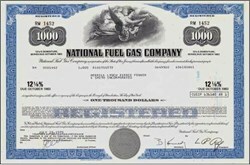 National Fuel Gas Company (NYSE: NFG), was incorporated in 1902. It is a diversified energy company with its headquarters in Buffalo, New York. The Company’s assets are distributed among six business segments: Exploration and Production, Pipeline and Storage, Utility, International, Energy Marketing and Timber. National Fuel’s history dates to the earliest days of the natural gas and oil industry in the United States and the Company has been responsible for many industry firsts. The history of National Fuel closely parallels the history of the natural gas industry in the United States. Beginning in 1821, its predecessor companies were involved in many historic firsts. Today National Fuel Gas Company is managed with the same innovative and entrepreneurial spirit of its past. The following chronicles some of the historic firsts in which National Fuel and its predecessor companies participated. The first documented commercial use of natural gas in our country occurred in 1821 in the Village of Fredonia, New York. Local citizens drilled the nation’s first gas well to a depth of 27 feet and later laid lead pipe along the main street to illuminate 100 street lights. Not far from Fredonia is the hamlet of Barcelona, located on the shores of Lake Erie. In 1830, the Barcelona lighthouse became the world’s first navigational beacon lighted by natural gas. In 1870, a company in Bloomfield, New York bored pine logs and banded them together with iron, creating the industry’s first natural gas pipeline. It stretched 25 miles to Rochester, New York. Then, in 1872, the first metal natural gas transmission line was constructed carrying gas from a well in Newton, Pa. to Titusville, Pa. In 1886, United Natural Gas Company, which later became a subsidiary of National Fuel Gas Company, constructed an 87-mile wrought-iron gas transmission line from gas producing areas in McKean County, Pennsylvania to Buffalo, New York. This was recognized as the world’s longest natural gas pipeline and was considered one of the construction marvels of the time. In 1899, the world’s first 1,000 horsepower gas engine-driven compressor was installed by United Natural Gas Company. These compressors were able to effectively raise and lower gas pressures and control gas flow, allowing gas pipelines to handle increasingly large quantities of gas. By the early 1900s, natural gas had proved to be an ideal fuel for cooking, heating water, heating homes and lighting and many communities had developed independent gas systems to supply the demand of local citizens. However, when the original wells were exhausted or when the demand for gas became greater than the local wells could supply, troubles began. The need for a coordinated gas supply effort became apparent. In 1902, National Fuel Gas Company was formed. It eventually merged with or acquired assets of many companies. These subsidiaries laid interconnecting pipelines, tying the many isolated systems into one big network. In 1916, Iroquois Gas Corporation, a National Fuel subsidiary, proved that significant quantities of natural gas could be stored in tight formations of depleted gas reservoirs. The first underground natural gas storage reservoir in the United States was therefore developed by National Fuel at Zoar Field, just 40 miles south of Buffalo. The development of underground natural gas storage in depleted gas fields became a significant economic asset of National Fuel. After World War II, in order to accommodate the skyrocketing demand for this economic fuel, the gas pipelines in the east were connected with the vast gas reserves being discovered in the southwest. Companies like National Fuel with storage capacity could buy southwest supplies to supplement locally produced gas, inject some of this gas into its storage fields and pull it back out during the winter when gas demand peaked. This allowed National Fuel to maximize the efficiency of its pipeline system, increasing the economics of an already economically attractive fuel. Other firsts followed: the first gas-fired generator to produce electricity for pipeline protection; in 1973, the first meter-order system to provide computerized scheduling and routing; in 1993, operation of one of the first state-of-the-art computerized one-call centers to increase the efficiency of customer responses by telephone. Today, natural gas is the most popular, environmentally sound and economic fuel choice of homeowners and businesses in the country. National Fuel is proud to have been an innovative leader in the development of this industry. The company history is from Natural Fuel's website.